A symbol of restraint; of the principle tenets of the Order; of Skill and knowledge, since without their use, a square cannot be erected and without a square, a temple cannot be built. 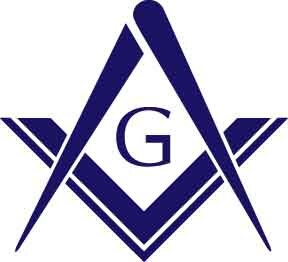 The Square and Compass are universally the symbol of a Master Mason; of Freemasonry. A thousand devoted symbolists have read as many meanings into both these tools of a Mason. Both symbols are much older than Freemasonry; Chinese manuscripts give them a Masonic significance (although there was no freemasonry in that country) two thousand years ago. No symbols in Freemasonry offer so many possible interpretations. But, many symbols may be different thinkgs to different men; each interprets what he can from a symbolism so deep as to be almost embracing. In modern Masonic rituals, the compass is "dedicated to the craft" and is emblematic of restraint. Years ago, the philospoher Burke said :men of intemperate passions cannot be free; passion forge their fetters." It is passions in the larger sense; intemperance, excess temper, unjust judgement, intolerance, selfishness, that the spiritual compass circumscribes. Excerpted from “Handbook for Candidate’s Coaches” By The Committee on Ritual and Donald G. Campbell, Past Grand Lecturer. Grand Lodge F.&A.M. of California. A personal comment by the webmaster: In my studies, the Square and Compass has come to mean to me a diagram of the world, caught in between that of the mind or spiritual world (The Compass) and the realm of the physical, the earthly plane (The Square). As we progress through the degrees from Entered Apprentice to Master Mason, we learn the use of these vaulable tools, and watch as the compass itself slowly gains ground over the square, symbolizing our spiritual growth and mastery of the mind over the material world. In addition, this symbol has three elements to its design, the Square, the Compass, and a representation of God. Masonry has three degrees. What is the obvious conclusion? Each part of the compass represents a symbolic degree, the "Earthly" or Strength, the "Mental" or emotional, and the "spiritual" or religious, or "Beauty" of God. Agin, brings me back to beauty as the crowning achievement, the true realization of God in Man.